Harmonica master James Cotten, dead at 81 years old. He was a great player and a huge influence on my particular harmonica hero, Paul Butterfield, but Cotten's playing never grabbed me the way it did most other blues aficionados . There was nothing wrong with his playing, and I wasn't looking for flaws or mistakes--his tone was second to none , his phrasing and the way he could build a solo were testaments to what can be done in a 12 bar and 16 bar format, his sense of funk revealed the dual qualities of grit and artful finesse-- it's just that I was paying attention to other players. One can say that I had missed my chance to attain a lifelong love of the man's music. Still, I liked his playing and tip my hat to his legacy. He helped create a path later players I would follow in turn .This is as fitting a tribute I can manage, and I apologize to any stalwart fan who might be reading this searching for more animated words describing this good man's life. All the same, godspeed and rest well, Mr.Cotten. For Chuck Berry, gone at 90 years old, what can one say other than he perfected rock and roll as musical form and going aesthetic concern?Chuck Berry is the Beginning of it all. His is a shadow that falls over ABSOLUTELY ALL who took up guitar after him. He created the language and vocabulary of rock and roll, both as musician and songwriter. His body of work , truly, is the Gold Standard against which all others are judged. One may be considered a jazz guitarist if one hasn't studied the work of Django or Joe Pass, but if a would be -rocker hasn't learned Chuck Berry's resolutely brilliant set of chops, may relinquishes the right to call themselves a rock guitarist. All good things in rock and roll pass through the innovations of Chuck Berry. He is to rock and roll what the oracular literary critic Harold Bloom says --too sweepingly, perhaps-- Shakespeare is to the rest of literature--without his existence , we would be saying less interesting things about our lives in far , far less imaginative ways. 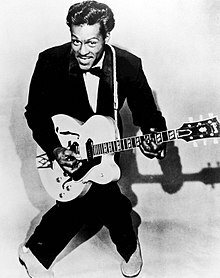 Without the emergence of Chuck Berry , with his assimilation of American music styles ,verbal idioms and his desire to create something new from the energetic geniuses that moved him to pick up a guitar and a pen, our imaginations, if not stymied, certainly would have collectively stalled, and that would not have been good at all. Hail, Hail Rock and Roll.